Dude, congrats. I have recently taken heavily to squats following a modified Starting Strength program. Squats are just brutally hard, and I am only doing them every other day. I can't imagine getting under 450 EVERY FREAKING DAY. Well, not yet at least . . .
And then with the whole Reebok thing, crazy you can stay that focused. Idea for you next challenge. Run as many miles as you are old on your next birthday. I just did 30 on my 30th and with minimal running training. I just came across this. 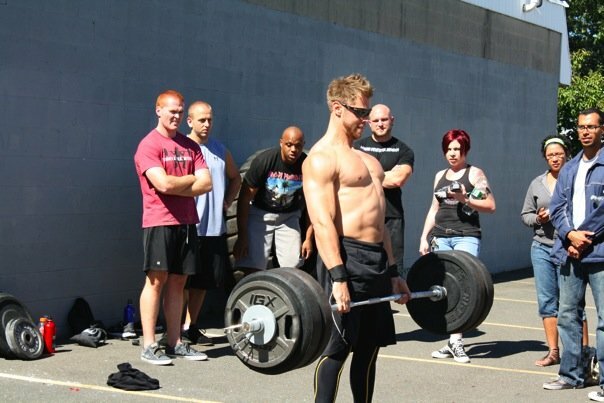 I am currently training with a CrossFit trainer to be able to run a 5K in what I hope to be in Honor of my brother who has metastasized melanoma. I'm doing all I can for Melanoma Research. It's not just cancer on the skin...it can spread to other organs which so many people don't know. Did you make any progress on your squat?